The XJ9 is a bean to cup coffee machine suitable for a small office, bar, restaurant or meeting room. It is ideal in scenarios where up to 50 coffees need to be produced per day. The XJ9 will produce 2 espresso and black coffees at a time with the adjustable double spout or alternatively it can produce cappuccino and latte one at a time. Unlike some of the larger Jura coffee machines the XJ9 only has one bean hopper and grinder which obviously does not allow you to use different types of coffee beans at the same time as you can with the GIGA X7 for example. All drinks are produced very easily with the touch of just one button. As with all bean to cup coffee machines, and in particular those that use fresh milk, regular cleaning is a must. A milk cleaning cycle must be run every day and the coffee brewer cleaning cycle and descaling cycle both need to be run regularly (perhaps once or twice a month depending on usage) to prevent problems occurring. The water tank features a small Brita water filter that helps to optimize the quality of the drink produced. 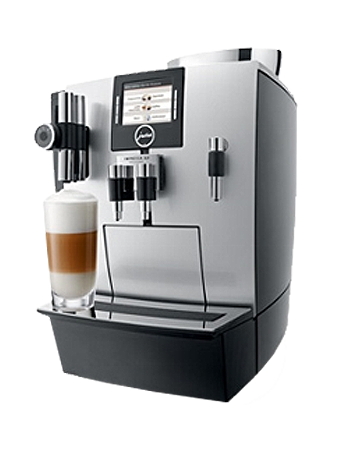 We offer the full range of commercial Jura coffee machines across London, Buckinghamshire, Hertfordshire, Berkshire and parts of Surrey. Our technical support team are fully trained to be able to give all the service back up that you may require on this or any other Jura coffee machine. We also stock the full range of filtration and cleaning products that will be required to keep your XJ9 in top condition as well as a range of coffee beans that when used in conjunction with this machine will produce a great coffee. If you would like any advice on this or any other machine in our range please do not hesitate to call the office.